For Edo State’s economic circumstance, the future gleams with a lustre of genuine prosperity. This is not only because the governor of the state, Mr. Godwin Nogheghase Obaseki is a technocrat; it is because he is also completely committed to developing Edo in every sector. To that end, Mr. Obaseki led a delegation to China. One of the focal points of that trip was to explore means that will go in tandem with his promise to create 200,000 jobs and rapidly develop Edo State’s industries. One gets the feel that as the industrial revolution visited England, so will Mr. Obaseki’s administration visit something similar upon the economy of Edo state. Prior to the industrial revolution, Britain’s economy seemed to slumber in semi-soporific stagnation. Although Edo’s economy is not stagnating, the country’s general economy is in recession, and if states do not stop suckling from federal allocations in order to grow, they will soon meet with some economic misfortune or the other. Therefore, Governor Obaseki’s trip to China centred on developing and fostering relationships with companies bearing the capacity to further the dream of revitalising the economic role of Gelegele. Over 100 years ago, Gelegele was the route employed by the Portuguese and British for trade missions to Benin. That route remains viable today and it is the goal of the governor to create a river terminal and an industrial park in that area. In doing so, Edo would take advantage of its geographic position as a junction state for the entire nation. Judging by historical precedence, the move to revivify economic activities through the Gelegele channel is a potential home run. Japan and China remained locked up in their own world until they opened up their ports and started to trade and do business with the west. Therefore, should the Gelegele seaport be actualised, the people of Edo are likely to witness an economic boon capable of injecting life into all sectors of the state. The potentials are vast – employment, financial uptick, industrialisation, immigration and the creation of an export-free zone are among the possibilities that could come to fruition in Edo state when the construction of the Gelegele seaport is completed. The delegation that went to China in conjunction with the governor included a prominent citizen of Edo State, Captain Osa Okunbo; Federal Government representatives from Nigerian Export Promotion Council (NEPC), Nigerian Import Promotion Council (NIPC), and Ministry of Agriculture. They engaged in talks with potential partners on developing a veritable Agro-Industrial Park. During the trip, the governor canvassed for support in such areas as supply of technology, equipment, high yield seeds as well as technical practice training for Edo farmers. Also discussed was how to put in place a system of value-added agriculture that engages processing for increased revenue with the possibility of Edo State partnering with the private sector to become a net exporter of Agro products. Finally, on the back of the success of Edo State becoming one of two sub-nationals on the continent to qualify for World Bank direct budget support, the Governor approached the China Exim bank regarding criteria for States to qualify for Project Finance Support. 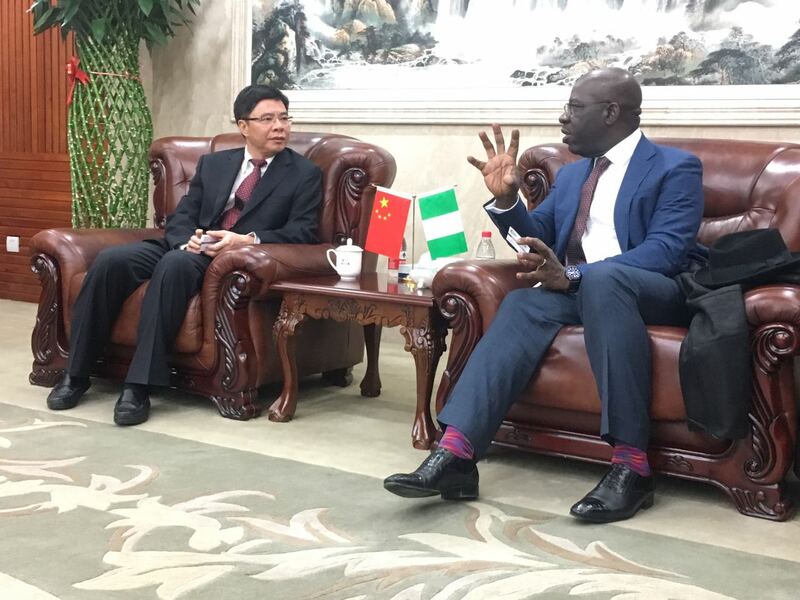 The meetings were successful and the people of Edo state will soon start witnessing the yields of the trip to China. There were resounding commitments by the various Chinese firms to invest in the aspirations of Edo State. Particularly interesting and attractive was the prospect of the Gelegele port and the surrounding Industrial Park that can develop from such a project. Obaseki met with the Managing Director of China Harbor Engineering Company, a company renowned as a provider of services in Engineering-Procurement-Construction (EPC), Build-Operate-Transfer (BOT), and Public-Private-Partnership (PPP) for both public and private sectors. The company also deals in marine engineering, dredging and reclamation, roads and bridges, railway construction, airports, and even equipment assemblage. Other companies whose directors and executives Obaseki met with are Kingpeng Group, Power China, China Exim Bank. In all these, Obaseki has the blessing of Edo people and that of the Oba of Benin, Omo N’Oba N’Edo Uku Akpolokpolo, Oba Ewuare II, who promised to support him on his mission to revitalise the economy of Edo State. The Oba made this promise when he visited the governor at the government house in Benin City alongside his palace chiefs. This was shortly after the Governor returned from his trip to China. Oba Ewuare II vented his support for the Governor on his efforts to develop the area into an export free processing zone and for inaugurating the Gelegele Development Technical Committee. To boot, the Oba said, “The export free zone can also have an airport strip to evacuate processed goods from the zone and also road network once the roads are also developed. We talked about the possibilities of setting roads and the possibility of developing some power in that area”. It may start like a trickle, as all great things do, but Obaseki’s trip to China proves him an astute and focused economic strategist with a clear-cut plan to make Edo state great again. He seems to be treading in rapid steps in the right direction with the sure-footedness of a hunter in the woods. He is gunning for the development of Edo, and should he continue the way he has started, then he definitely will find it.